Some of my favorite songs and tunes are terribly hard to sing. They seem tuneful but defy my efforts to sing them, leaving me in a somewhat embarrassing and inarticulate heap of grunting and muttering, with an occasional sustained high note. I could make a list, but I trust (perhaps naively) that I am not alone in this experience and am hopeful that you all have songs that are similarly enticing and beguiling. Apart from the sense that these tunes are "melodic" in some way, even if they are hard to sing and their "melodies" perhaps even impossible to fully identify, these songs have other features that are enticing: their formal repetitions (one more chorus, please! ), their singular moments (what a great bridge! ), and their surface characteristics (sheesh, I love those ornaments and blue notes, wish I could do that!). 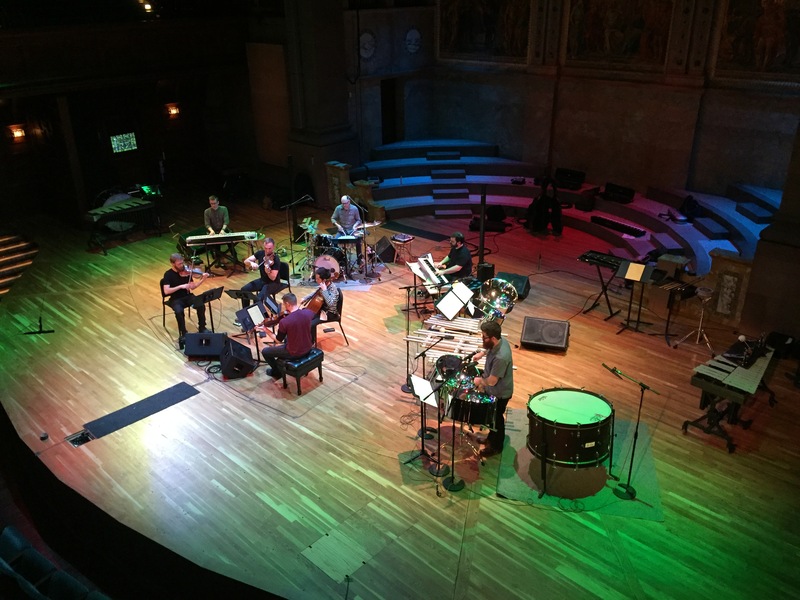 In the process of writing this piece for possibly the most incredible contemporary music band imaginable--So Percussion and the JACK Quartet... combined!--I found myself thinking about "songs" in all of their mysterious and wonderful facets. While I think most of these pieces will be hard or impossible to sing, my hope is that they feel like songs in various ways, like something we might be able to sing in a parallel universe, or, most ambitious, leave us wanting to sing them, even if we can't. Perhaps Yeats was on to something when, in his penultimate poem Cuchulain Comforted, he tells us "Now we must sing and sing the best we can.... Or driven from home and left to die in fear." Songs That Are Hard To Sing was premiered at Carnegie Hall in March of 2018, and will be recorded in 2019. Waveguide Model I is collective decision-making piece created with Mark DeChiazza for the PRISM Quartet, inspired by emergent phenomena like flocking and schooling as well as pieces like Riley's In C, Andriessen's Workers Union, many of Cornelius Cardew's works (The Great Learning), and my own Clapping Machine Music Variations and There Might Be Others, all of which are participatory pieces in some fashion (see the postamble for more of a pre-history and rationale). The piece was composed with the broader aim that meaningful interaction and feedback between the players and other elements, visuals in particular, might be possible, and was deeply inspired by conversations and collaborations with Naomi Leonard. Olagón, a conflicted wail of both mourning and victory, stands as the central inspiration of this new evening-length collaboration between Eighth Blackbird, composer/fiddler Dan Trueman, vocalist Iarla Ó Lionáird of the contemporary Irish supergroup The Gloaming, and Pulitzer-Prize winning poet Paul Muldoon. 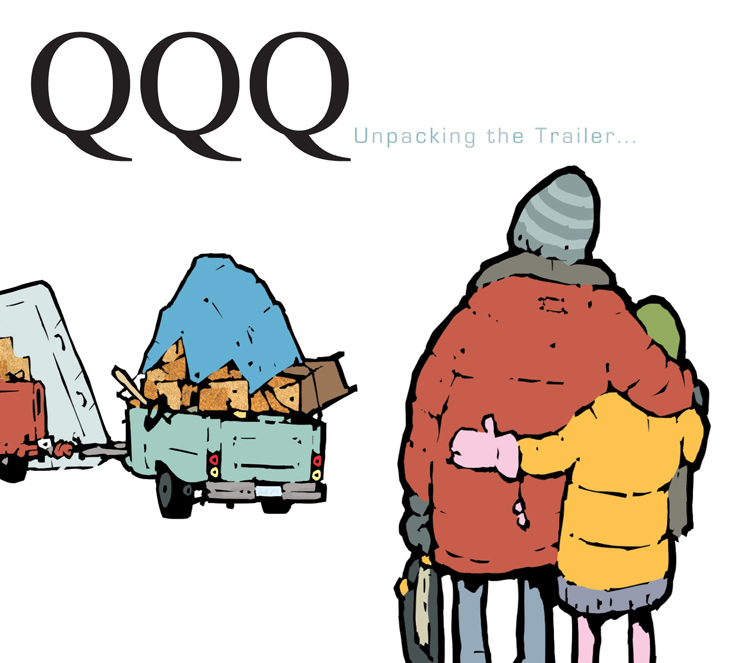 Drawing from the legendary Irish tale Táin Bó Cúailnge, Olagón aims to tell a story of hardship in contemporary, post-recession Ireland while honoring traditional musics of Ireland, Norway, and America. Muldoon's text--utilizing both English and Irish--is sung in the unique and highly ornamental vocal practice known as Sean Nós by Ó Lionáird. 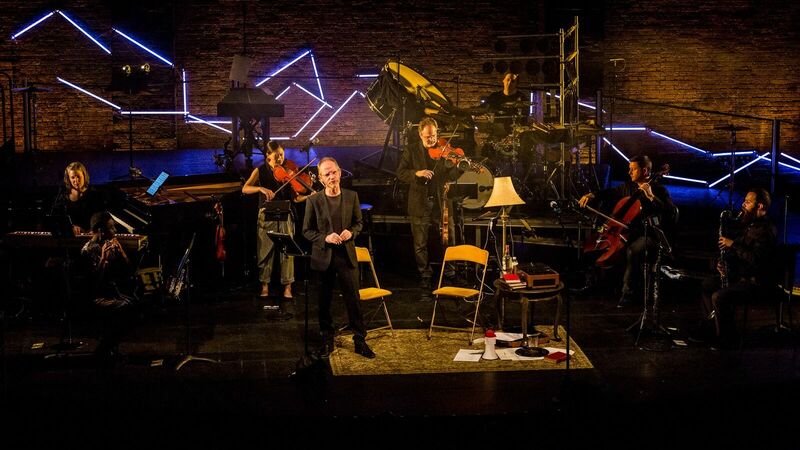 When coupled with Trueman's diverse musical landscape, stage direction by Mark DiChiazza, and the virtuosity of Eighth Blackbird, a multi-cultural experience unlike any other is brought vividly life. There Might Be Others is an emergent piece, inspired by the modular structure of Terry Riley's In C. The musicians and dancers work together, in parallel, with a collection of dance and music "modules." The ordering of these modules is up to the performers and is determined on the fly, in performance, and while the dance and music modules were conceived together, they will often arise out of sync with one another, overlapping in intriguing and unexpected ways. "Delphica Gaedhlica" is a macaronic setting of the third of the Prophetiae Sibyllarum and is inspired in part by the wonderful Lassus motets. The setting is primarily in Irish, using a translation by Iarla Ó Lionáird made for this piece, though parts of the Latin and English versions also find their way in. The opening clause--He shall not come slowly--takes on strikingly different characters in the different languages, lyrical in the Latin, a bit cumbersome in English, and almost violent in Irish; these characters gallivant and occasionally meet, suggesting different meanings as the piece develops. I am deeply grateful to the wonderful people of Gallicantus; what extraordinary voices and musicians! Marbles began as an etude (one of eight etudes called Nostalgic Synchronic) of the same name for "prepared digital piano," an instrument I designed to explore various metric and tuning ideas. The etude itself remains largely untouched in this setting, and is adorned and recontextualized in various ways by larger ensemble. 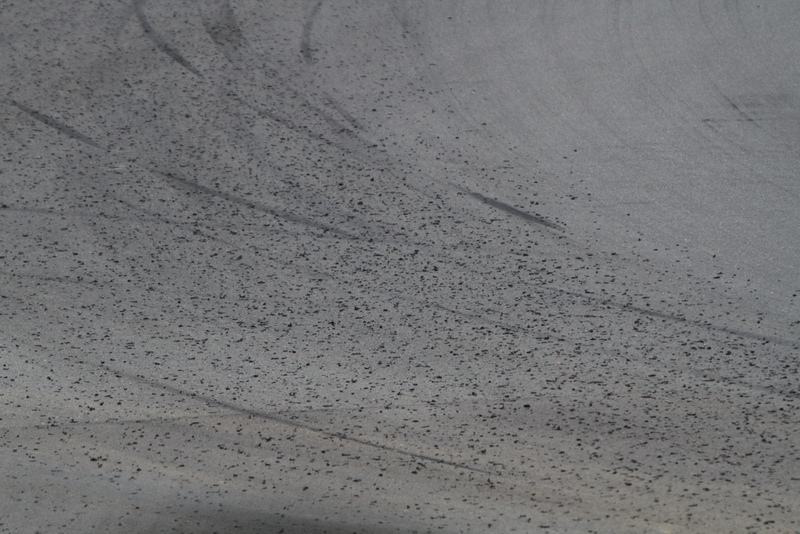 With regards to the title: the little bits of rubber that racecar tires shed while turning are sometimes called "marbles." Sonically this seems about right for this etude, but I also like the racecar driving metaphor; the driver is not expending energy directly to drive the car, but is rather virtuosically handling a powerful beast, sometime slowing it down, pushing it one way, using the smallest muscles as well as the largest. We should have more musical instruments that are like racecars. Commissioned by the International Saxophone Symposium and Competition (ISSAC) and Columbus State University, A Palimpsest is based on my own Nostalgic Synchronic Etude #5, titled "Wallumrod," which itself is inspired by a particular voice-leading move by the Norwegian "jazz" composer Christian Wallumrod, and I'm quite sure his voice-leading move is a misuse of something similar from the early Baroque, in some way. In any case, this particular version gradually erases itself. a recording by Adam Sliwinski is scheduled for release on the Fall of 2015 on New Amsterdam Records. Orchestral settings of three traditional sean nós songs, as part of the Iomas Project. I was thrilled to be invited by Iarla to set these songs, the first of which is in Irish, and tells of the ancient landscape around one of Ireland's most well known lakes. The second two are macaronic, in both Irish and English. "Siúl a Rún" is a well known old song that Iarla learned from his great Aunt Elizabeth Cronin, one of the great figures of sean nós singing, and is told from the point of view of a young woman trying to bid her lover farewell as he leaves for war (perhaps). The last song, which translates as "I am Weary of Lying Alone," is a fitting end to the sequence, though is perhaps not just about mourning. These songs, which are performed continuously as a complete set -- a mini oratorio of sorts -- were premiered at the National Concert Hall in Dublin by Iarla and the RTE Concert Orchestra in September 2013. Read more: an article in the Irish Times, and a review. our first recording was released in the Fall of 2014.
a suite for steel pans (with kick-drum and hi-hat), composed for Josh Quillen. In three movements, Rink's outer movements are intensely rhythmic, pitting different limbs against one another in a kind of taut, conflicted choreography. 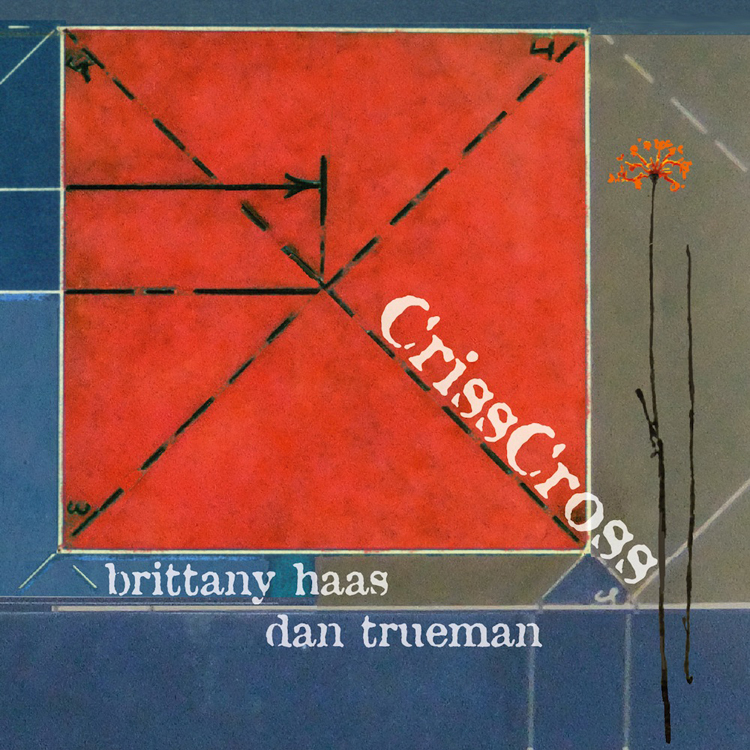 The middle movement is Josh's arrangement of a lyrical fiddle duo that I made as part of the CrissCross project with Brittany Haas; it's awesome to hear Josh bring it to life in with what might possibly be the polar opposite instrument from the fiddle. Big thanks for Josh for asking for this piece and doing such great work with it -- and it is a monster! He has made a wonderful recording, with lots of other great music on it; check it out. check out one of the tunes. Both Ligeti's famous Musica Ricercata II, for solo piano (perhaps most known for its cameo in the Kubrick film Eyes Wide Shut), and my own Four, for, um, solo 6-string electric violin (unknown for anything, as far as I know) are spare, spacious pieces, featuring just a few notes, oft repeated and separated by long silences. In an experiment in musical vandalism, I have smashed these two pieces together and filled most of the silences as best I can. 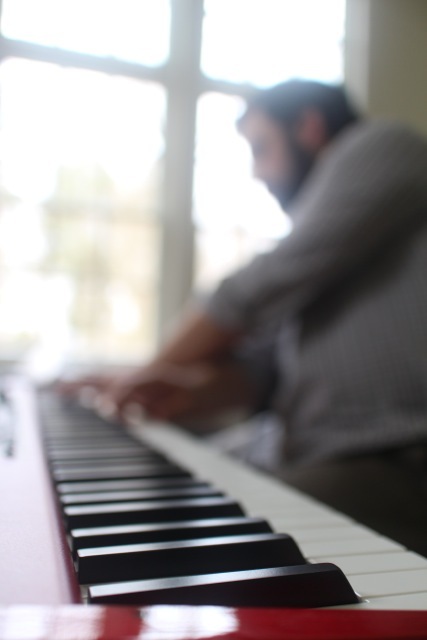 At the heart of this new Frankenstein is a pair of "synchronic metropianos:" laptop-interconnected, strangely-tuned virtual pianos with embedded, pitched metronomes (don't worry if that's not crystal clear -- you'll hear). This pair, in tandem with a good, old-fashioned piano, creates a constantly shifting core of meter changes, among other things. Surrounding this trio is a cohort of other laptop instruments, or just a good old chamber ensemble, depending on which version is in the works. Some of the laptop instruments slowly sustain the piano sounds with modified golf video-game controllers (the tethers, fast becoming a standard instrument in the laptop orchestra worldwide; no kidding here!). Others type, creating chattering clusters of clicky sounds, all synchronized via a wireless network. Finally (speaking of Frankensteins), others play a bizarre digital hybrid of the flute and electric guitar (affectionately called the blotar, a brainchild of the nutty Dr. Perry Cook), also with the tethers (multi-talented, these tethers), using a neural-network created with PLOrk co-Director Rebecca Fiebrinks fantastic Wekinator. Finally finally, the piece closes with the chatter of as many mechanical metronomes as we could muster, something Ligeti himself would surely have appreciated. Did I forget anything? I'm grateful to these wonderful PLOrk students for being so adventurous in taking on this piece and to Kathy Supove for inspiring this piece at the outset. commissioned by Western Michigan University for the Kalamazoo Laptop Orchestra. "Justice is a fickle thing!" This piece, like Justice herself, is one crazy contraption, with Disklaviers tuned up this way and that, tethered to one another via a laptop with a relentless virtual metronome, other laptopists chattering and chanting about this and that, typists typing away, busy as can be, a fiddler occasionally emerging, playing a tune, and mysteriously disappearing. Underneath it all is a carefully constructed if seemingly arbitrary set of limitations -- laws, perhaps -- that divide the ensemble in two, half believing one thing, half believing another. Rather than try to explicate these laws (those interested are welcome to examine the score and the software, where these laws are laid down), let's just describe the whole scene as a musical-magical-realist-social-networked Law and Order about a Norwegian wedding gone wrong. Will Justice ever be Compleat? I am grateful to Grady Klein for creating such a witty and intriguing text for the piece. I am also grateful to David Code and David Colson at Western Michigan University for initiating and enabling this commission. Justice Partial was premiered in the Fall of 2012 in Kalamazoo, Michigan. (flute/picc, clarinet/bass-clarinet, trombone, percussion, piano, laptop, violin, viola, cello, bass). Walking wobbly whilst waking and warning and being warned of the ways of the world and the underworld: these are all at work in the Symphony of W's. I call this a symphony in part because it is first and foremost simply sound and music: a "concord of sound," I hope. It is in four movements, like many symphonies, though perhaps the symphony it is most indebted to is Stravinsky's Symphonies of Winds, which is in but one short movement. Also, like many symphonies, it easily enough inspires a story, or the sense of a story as it may be. W's kept cropping up as I composed this piece: the footsteps of a drunkard walking wobbly towards an abyss in movement 1; an Old Time tune called Ways of the World, which inspired the New tune I made for movement 2; an obscure Robert Frost poem -- Warning -- which I set more than 25 years ago and revisited for movement 3; and finally a sense of slowly waking, rising into a new world in movement 4 (there is also a bit of thievery here, from a famous Bach Chorale that features an ascending whole-tone scale). Finally, I can't deny that I was also hoping to reclaim this wonderful letter from it's political associations in some small way; it is full of zigs and zags and pizzazz, and deserves better (though the recent revelations of the former president's private painting habit make me wonder). Symphony of W's was premiered by Crash at the Museum of Contemporary Art in Dublin in 2011.
for laptops and any number of acoustic instrumentalists. 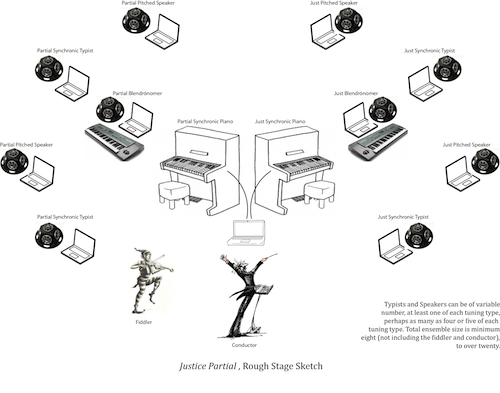 At the core of Clapping Machine Music Variations is a pair of laptop-based Drum Machinists. Surrounding this duo is an assortment of other instruments, some clearly defined laptop-based instruments, others more variable and traditional in type. 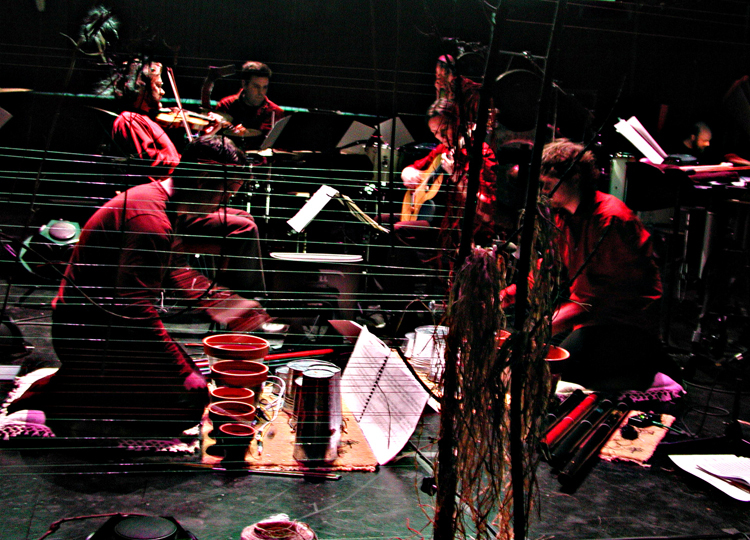 CMMV takes specific inspiration from works by Steve Reich, Gyorgi Ligeti and Bjork. In particular, the drum-machine algorithm was initially designed to mimic certain rhythmic processes in the Ligeti Etudes pour Piano, processes which also coincidentally generate the rhythmic pattern for Reich's Clapping Music (this should come as no surprise, as both composers were deeply influenced by traditional African rhythms); this algorithm is then used to generate variations on the original Clapping Music pattern, variations that are explored over the course of CMMV. More generally inspiring are pieces like Riley's In C,and Andriessen's Worker's Union, where some things are specified, other things are not, and anyone can join the party. under some duress, i wrote a paper about this piece. a new version will be released as part of The Sideband Chronicles in late 2015. Unlike the anvil or pulley, the computer hides its purpose --to strike or yank will only break. What is this "tool" we call a computer? It is surely not really about computation, and what does it offer us as musical beings? neither Anvil nor Pulley is, in short, a wordless musical epic that explores the human/machine relationship in the digital age. Are there musical places we can travel to or musical buildings we can construct with this tool that were impossible -- even for us to imagine -- with its predecessors? 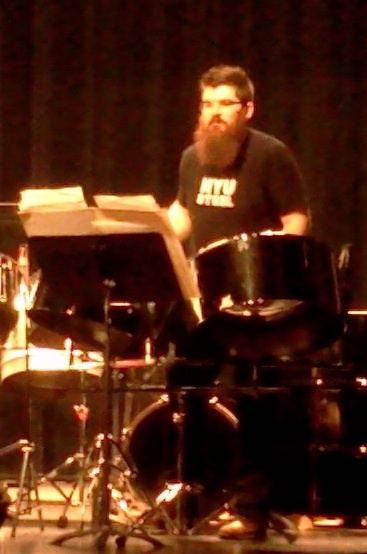 Composing for (I really should say "with") So Percussion is an incredible pleasure. Their collaborative and adventurous spirits (not to mention their sheer musical abilities) are awesome. In the past, I've had the privilege of actually performing my own music with them; while I don't join them in neither Anvil nor Pulley, a doppelganger of sort -- in the form of a turntable -- sits in. The Princeton Laptop Orchestra (PLOrk) is a new ensemble of computer-based instruments that is exploring how laptops can be used to make music in both new and old-fashioned ways. New: exploring the laptop's ability to manipulate time, timbre, and tuning, among other things; Old: operating (more or less) within the familiar social and acoustic contexts of the orchestra, chamber ensembles, fiddle bands, jam sessions, etc... We use funny looking speakers that roughly emulate the way acoustic instruments cast their sound about, and we sit on pillows, as if to meditate, but more often than not debugging our "instruments." In this piece, a subset of PLOrk sits in front of the orchestra, in the manner of a concertino, though musically acting quite differently, sometimes processing the sounds of an orchestra to create gentle harmonies, other times providing a (wirelessly synchronized) warped metronome (inspired by Norwegian dance music, of all things) for the orchestra to follow. The laptop itself is our instrument in this piece; we smack it (and are actually able to control its sound this way!) and drive with the trackpad and keys, sometimes treating it like a glass harmonica, other times a weighty hand-drum. In the original Star Trek (I believe), a distinction was kept between carbon-based and silicon-based beings. Carbon and Silicon, but one row different in the table of elements, are functionally quite similar, but different enough that life is built on carbon, computers on silicon. In this piece, we are exploring one particular way that familiar carbon-based music making can meet new, silicon-based music. Silicon/Carbon was reviewed here. And you can listen here. in three parts, to be performed in any order, combination, or individually. In my very first composition class when I was 22 (I got a late start), one of my peers argued passionately that a good piece will have all its materials in the opening moments and that its trajectory will be predetermined from this moment on. Beginner that I was, I was impressed if not convinced, and today I find it hilarious. The three "variations on a piece" that make up Triptick all begin identically and then diverge, introducing new material as needed. Another motivation for this design were words that have multiple seemingly unrelated meanings: Foil, Clock, Stretch, Keen, Hide, Trip, Tick, etc.... (try thinking of these when falling asleep). 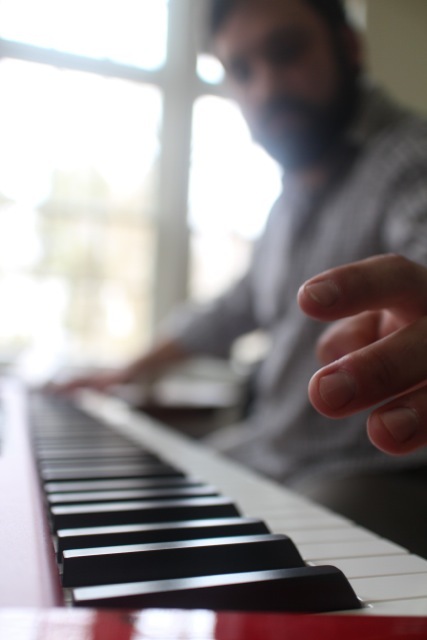 Is it possible for music to function analogously? In each of these pieces, I had a pair of such words in mind and allowed their meanings to inspire my compositional process, sometimes directly, as with "stretch," which directly motivated both the warped meters and stretched chord progressions (where a stack of minor-9ths is gradually stretched to a stack of major-9ths, for instance). A third inspiration for composing a "variation in pieces" is the work of many painters (my mother included) who will paint a series based on a single subject; why choose one? Finally, I have an abstract feeling that somehow this piece is indebted to Schubert; material heard earlier floats by periodically, and then disappears, as if in a dream--not unlike my experiences hearing, say, Schubert's Eb Piano Trio. 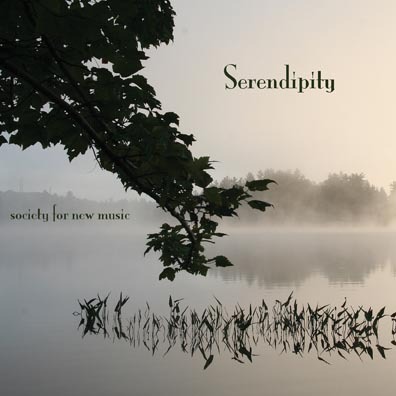 A recording of Triptick was released by the Society for New Music in early 2010. ... is an hour-long performance piece combining animated paintings, spoken word, and electronic chamber music performed by the groups Trollstilt and So Percussion. The animated paintings, by Judy Trueman, are framed by a whimsical creative filter where older works of art (pieces by Matisse, Agnes Martin, and others) are re-imagined as gardens, and then abstractly painted and animated. Music by Dan Trueman is performed with a "garden of instruments," including amplified tubes (the eToobs, reaching 10 feet in length! ), terracotta pots, buckets of water, toy pianos, and a big blue wheelbarrow. A laptop is used to process these instruments and "paint" unusual sonic textures on a set of hemispherical speakers distributed throughout the ensemble. Poems by Jennifer Trueman, inspired by the writings and quotations of these same artists, emerge from the "garden" as well, performed by J. Trueman and Rinde Eckert. 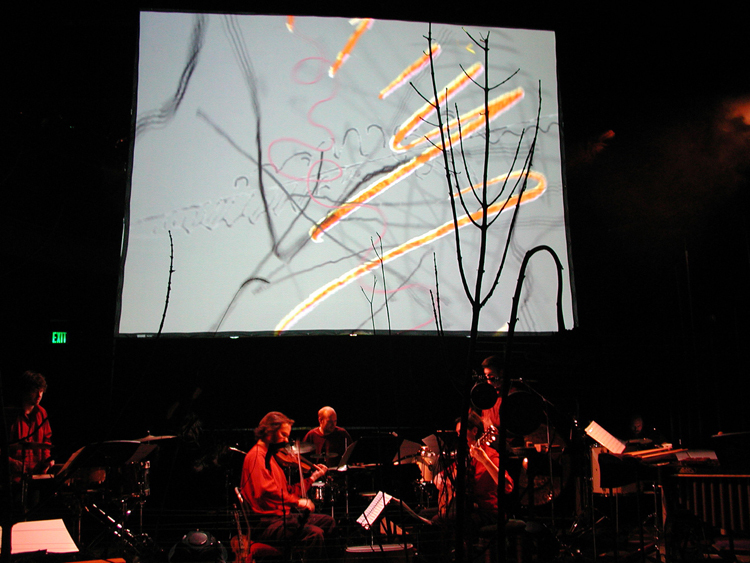 The video included here includes only the animation; the piece proper is a live performance piece, and seeing So Percussion perform with the various instruments is central to the experience. "While I don't usually get technical in program notes, but here goes... Traps is a delicate exploration of a simple process I call "traps." A trap is a way of forcing whatever note I play to be transposed to a single pitch (or set of pitches); while I play, the computer remembers that last couple seconds of what I have played and then, depending on the note that I play, transposes it's memory to the "trap" pitch. So, for instance, when the trap is a high F, if I play an A below that, the "trap" will, some short time later, transpose my remembered A up a minor-sixth, so it sounds a high-F. The only "problem" is that sometimes the trap's memory might be long enough to remember other pitches I had played prior to the A, say, a low open D-string, so that D will also get transposed up a minor-sixth, to B-flat, yielding a not-quite-simultaneous sonority D-Bflat-A-F. This is precisely how Traps begins, and it continues slowly through a series of ascending traps, some of which are single notes, others two-note traps." Traps Relaxed starts similarly to the original Traps, but gradually diverges, relaxing into possibilities offered by the larger ensemble, and ending up half-again as long (about 13 minutes). In this performance, I use eight hemispherical speakers to distribute the sounds of the "traps" throughout the ensemble. These speakers, which I designed with my father and Perry Cook, radiate sound more like conventional instruments and, if things go well, should help the electronic sounds emerge seamlessly from the acoustic ensemble. I have used these speakers with smaller ensembles, but never on this scale before, and I can safely say that I would never have composed this piece without them; I simply can't imagine this piece realized with a conventional PA system. Traps Relaxed was commissioned by the American Composers Orchestra, Steven Sloane, music director; Robert Beaser, artistic director; Dennis Russell Davies, conductor laureate, for its "Orchestra Underground" series. It was composed while supported by an Artist Fellowship from the New Jersey Council on the Arts. Premiered at Carnegie Hall's Zankel Hall on January 21, 2005. Transparent Body was composed for and with the Terrain Dance Company (a duo for Christopher Williams and Rebecca Lazier) and premiered at Danspace in New York City in September 2004. Transparent Body was featured at the International Computer Music Conference in the Fall of 2006 in New Orleans. Composition of Transparent Body was supported in part by a grant from the New Jersey Council on the Arts. A Cappella is a short, intimate piece, probably best heard from within the ensemble, where the subtle details of each instrument are transparent, summing up to a meditative, immersive whole. Inspired both by the sheer beauty of the sound of a cappella vocal ensembles (which is surely exceeded by the sheer beauty of eight cellos!) and by the abstract textures of some electronic music, A Cappella begins where an earlier piece of mine, Counterfeit Curio, finishes, belaboring possibilities that were at first inaccessible. 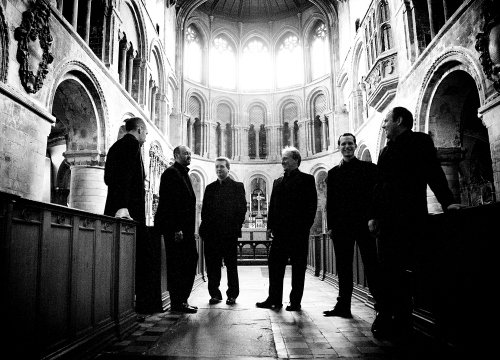 A Cappella was composed for the Tarab Cello Ensemble in January 2003.
included on the Machine Language CD. I don't usually get technical in program notes, but here goes... Traps is a delicate exploration of a simple process I call "traps." A trap is a way of forcing whatever note I play to be transposed to a single pitch (or set of pitches); while I play, the computer remembers that last couple seconds of what I have played and then, depending on the note that I play, transposes it's memory to the "trap" pitch. So, for instance, when the trap is a high F, if I play an A below that, the "trap" will, some short time later, transpose my remembered A up a minor-sixth, so it sounds a high-F. The only "problem" is that sometimes the trap's memory might be long enough to remember other pitches I had played prior to the A, say, a low open D-string, so that D will also get transposed up a minor-sixth, to B-flat, yielding a not-quite-simultaneous sonority D-Bflat-A-F. This is precisely how Traps begins, and it continues slowly through a series of ascending traps, some of which are single notes, others two-note traps. Traps was written in the opening days of the 2nd Gulf War; March 2003. Shocked and awed, indeed. Traps was premiered in the Fall of 2003 with the Brentano String Quartet and recorded with the Daedalus String Quartet. for flute/piccolo, clarinet/bass clarinet, violin, viola (or 5-string violin)/laptop, cello, piano, percussion. 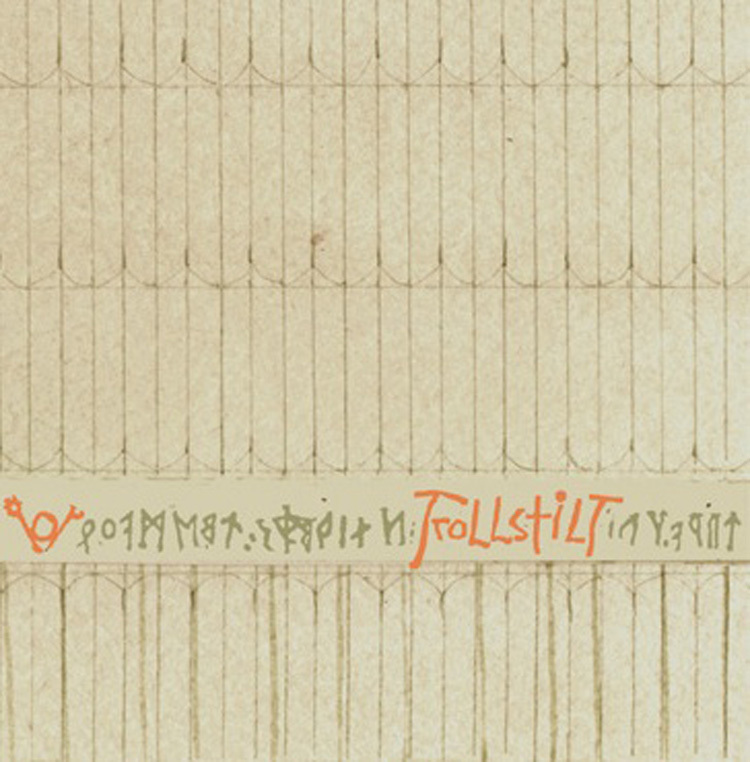 We discover a very old, noisy recording of an unfamiliar tune, a tune that seems archaic, belonging to a distant culture. We listen, analyze, dissect. We use it, appropriate it, and create a new piece that is meant to exhalt it. Our new piece begins with the old recording, and then abstracts it, taking it elsewhere, until we discover our own music in the noise of the old recording. Well, the story of Counterfeit Curio is quite the opposite. The "old, noisy recording," which ends the piece, is in fact a fake, created in the waning months of 2002, and the tune it holds is in fact original, new, and grows out of the music that precedes it. Rather than serving as a model, a trove of material to be used as a starting point, the tune is a postlude, an incomplete summary of its inspiration. The story of Counterfeit Curio is then not in discovering the history of the original tune, attempting to verify its authenticity, but in discovering the tune itself. Counterfeit Curio, composed in the Fall of 2002, was commissioned by the Society for New Music with funds provided by the National Endowment for the Arts. Still was composed for the American Composers Orchestra OrchestraTech Festival in 2001. Still (which originally had the awkward and irritating title, dis-(re)locations) was completed on September 11, 2001 -- I was holding the score in my hands as the news of that day came in -- and premiered just a dozen blocks north of the WTC site the following month; I went as close to the site as I could that evening and watched the empty trucks move in and the overloaded trucks move out. While not normally prone to paranormal or metaphysical thinking, I found it disconcertingly eerie that the kinds of musical ideas I was working with in the piece -- continuity vs. discontinuity; slowly descending, vanishing gestures; recollection; disintegration; senses of place -- were so powerfully -- indeed overwhelmingly -- at work during that day, and yet the piece had been completed earlier, without any knowledge of what was to come. In the study of genetic algorithms, computer scientists create virtual species with virtual genetic codes and allow for spontaneous mutations within some kind of Darwinian "survival of the fittest" context. These species reproduce and evolve, doing in minutes what has taken many millions of years for "real" creatures to do, often resulting in an unexpected beast who survives alone, victorious. In one particular case, the test for survival was a wrestling match; generation after generation, virtual wrestlers would tangle, mutate, and (if they survived) reproduce, their bodies evolving into highly optimized wrestling machines. One notably successful (and amusing) species that emerged was an enormously tall, wide and skinny creature that simply fell flat on top of its opponent, smothering it. Coming in at just under 20 minutes and moving with geological--as opposed to computational--swiftness, Machine Language is in part an imagination of the sounds of the languages these virtual species might speak, or perhaps of the music they might make. There is, I think, a sense of undirected evolution in the piece, but rather than gradual evolution, we have "punctuated equilibra"--discrete moments of change followed by lifetimes of relative stasis. And, rather than admiring a celebrating victor, we finish with harmonious (for lack of a better word) cooperation. In Grain and Shadow is from a series of pieces I have been composing that explore various potentials of my instruments, including the Bowed-Sensor-Speaker-Array and the electric violin. Using a simple granulizing delay-line algorithm (the munger~, which I wrote in C as an external for MAX/MSP, released as part of the PeRColate toolkit), In Grain and Shadow makes a lot from little, taking soft sustained notes and building fluctuating, harmonic textures. In addition to the familiar expressive dimensions of the violin, a foot-pedal is used to "play" the density and character of the clouds of grains that shadow the violin's sound, drawing them in tight around the violin, and then releasing them, obscuring the source completely; it is a song of slow inhales and slower exhales. In Grain and Shadow is included on a CD, titled "./swank," by my duo interface (with Curtis Bahn). "./swank" has eight tracks of improvised electro-acoustic music recorded live at Mobius Art Space in Boston (Perry Cook joins us on his sensor-digeridoo, the DigitalDoo, for one track) and was released by c74 Records (owned by Cycling74, makers of Max/MSP) in 2000. I had a scene in mind when putting together Waltz, a scene involving a one-sided conversation, an open window, music from afar, and a listener drifting between the day and day-dreams. I find it fascinating how we can listen through recordings to create virtual worlds and extreme psychological spaces. Waltz features real-world sounds, a 1917 recording of a Brahms Waltz (so noisy that it is remarkable that we can listen through it and hear anything at all), Monica Mugan's voice, and layer upon layer of hyper-processed electric violin.